Our local version of green salad, ensaladang Pinoy is equally healthy as its foreign favorite garden salad counterpart. And the ingredients can easily be found in your own backyard. There are different versions of ensalada the Filipino way. There is the ensaldandang ampalaya for a bitter salty sweet taste. And there is the ensaladang talong one of the most common that you can enjoy even if you eat in turo-turo or simply preparing it for your family’s everyday side dish. 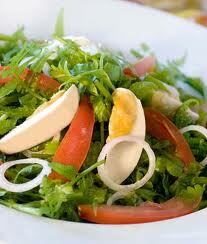 But unlike the foreigners’ taste palettes, we Filipinos like our green salads with a pinch of salty flavor. Here is a simple recipe of ensaldang pinoy made from malunggay, probably the healthiest and powerful green leaves in your backyard, and kang kong. Steam the kangkong and malungay leaves. Combined the cut vegetables and steamed leaves and mix it together. You can also add egg if you want to add more garnishing. Your ensaladang pinoy is ready to serve.